The Coast Spas Element B all seater hot tub has been best buy hot tub for 3 years running. There is no other 7 foot square hot tub to compare with the 6 impressive massage seats and a further higher, cool down seat which offers both relaxation and hot tub hydrotherapy. The Wellness X hot tubs have a raised curved back which incorporates the best hot tub waterfall in the world. The waterfall is 60cm in length and also delivers a tremendous neck massage – in fact, it contributes to creating the very best hot tub massage seat in any hot tub. This hot tub made in Canada, has an eye-catching, contemporary curve-linear design, both inside and outside the hot tub, making the Element B a genuinely stylish looking hot tub for your garden. This luxurious hydrotherapy hot tub has been designed and moulded with unique textured steps to help you get in and out of the hot tub and the non-slip seating surface also offers amazing tactile therapy. With plush head rest pillows and body shaped hot tub seating there is an amazing variation of hot tub massage experiences from gentle muscle stimulation to deep tissue, shiatsu massage. All Coast Spas boast the best commercial grade hot tub filtration which helps create the cleanest hot tub water and as a fully insulated hot tub all Coast Spas are also proven to have the lowest running and heating costs. The Element B all seated hot tub needs to be seen to be appreciated, as it stands out aesthetically from all other similar sized other hot tubs - Element hot tub owners have also discovered that it out performs all of the competition in every hot tub comparison with a more intense jet spa massage and cleaner hot tub water. Please look at our ‘why buy our hot tubs tab’ and find out for yourself that we have the best quality hot tubs. Also, click here to see our best hot tub reviews and best hot tub installations to see why we have world’s best hot tubs at the best hot tub prices. The Element hot tub made in Canada, is manufactured by Coast Spas. It’s not just a hot tub with waterfalls, powerful jets and easy maintenance, the Element boasts the best commercial grade hot tub filtration which helps create the cleanest hot tub water and as a fully insulated hot tub, all Coast Spas are also proven to have the lowest running and heating costs. The Coast Spas Element B all seater hot tub has been best buy hot tub for 3 years running. 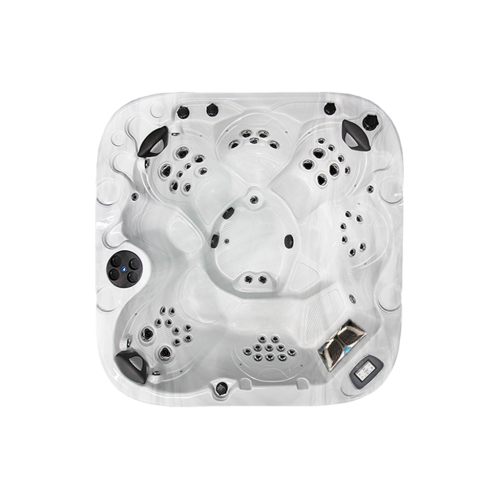 There is no other 7 foot square hot tub to compare with the 6 impressive massage seats and a further higher, cool down seat which offers both relaxation and hot tub hydrotherapy. This hot tub made in Canada, has an eye-catching, contemporary curve-linear design, both inside and outside the spa, making the Element B a genuinely stylish looking hot tub for your garden. This luxurious hydrotherapy hot tub has been designed and moulded with unique textured steps to help you get in and out of the hot tub and the non-slip seating surface also offers amazing tactile therapy. With plush head rest pillows and body shaped hot tub seating there is an amazing variation of hot tub massage experiences from gentle muscle stimulation to deep tissue, shiatsu massage. The Coast Spa Niagara Infinity Edge hot tub is one of the most unique and beautiful hot tubs in the world. Years of product innovation has perfected the most luxurious hot tub in the world. For the first time ever, a infinity edge hot tub (or vanishing edge hot tub design is available in a portable Hot Tub. This patented feature is more than just an aesthetically stunning hot tub, it successfully eliminates two issues; water displacement from multiple bathers (meaning the water level will not spill over the edge when there are multiple bathers) and the need for space consuming skimmers (the horrible hot tub grates all hot tubs have which collect all of the nasties which float around in all other the hot tubs. The patented Niagara Infinity Edge 7 person hot tub has the largest waterfall blade in the world – aesthetically, the effect is stunning; The Niagara is also a very versatile hot tub, it has a comfortable hydrotherapy massage lounger seat and room for 6 other people each seat is packed with soothing, powerful hot tub jets. The individual seating is subtly defined by soft curves and permits for at least 3 people to lounge out in comfort while enjoying the variety of hot tub jets. 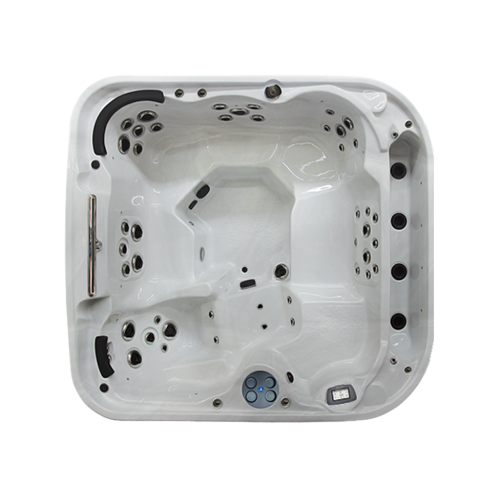 The wide corner seating and large footwell lets bathers manoeuvre easily around the hot tub to adjust and target their aching muscles onto rotating massage jets. This freedom to utilise each seat in a variety of body positions means that you can interact with the calmness of the infinity edge waterfall, the tingling reflexology of the large waterfall blade massaging your neck, be tactile with the various pulsating hydrotherapy jets or simply adjust to interact with garden views and friends and family. The Niagara is striking both from within, while bathing in the hot tub and from the outside - perhaps admiring from the kitchen window! The stunning curves and design offer both comfort and elegance. The Niagara is definitely a hot tub to view close up as it is from the Coast Spas Infinity hot tub range and the effects of the massage and waterfalls in images will look photoshopped in comparison. If you do take the trouble to go to a showroom – you will not be disappointed. The Niagara design is also very unique, it has a raised curved back which incorporates the best hot tub waterfall in the world. This waterfall blade is 60cm in length and also delivers a tremendous neck massage – in fact, it contributes to creating the very best hot tub massage seat in any hot tub. This luxurious hydrotherapy hot tub combines impressive hot tub waterfalls, the plush head rest pillows and body shaped hot tub seating, to create a sensual, social, sensory and sensational hot tub experience in your own home. The absolute superior presentation of this Canadian hot tub makes the whole ownership from hydrotherapy massage to easy hot tub water management a delight. The Niagara hot tub made in Canada, is manufactured by Coast Spas. 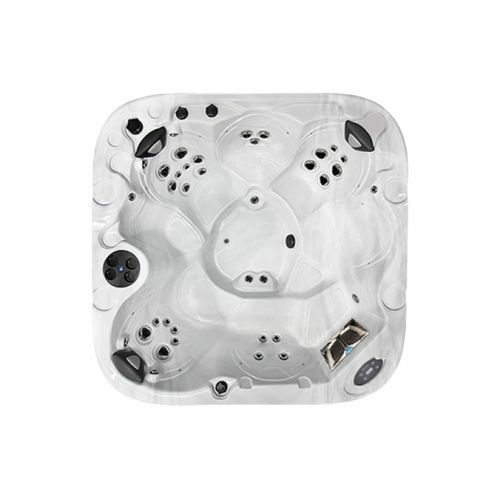 It’s not just a hot tub with waterfalls, powerful jets and easy maintenance, the Niagara boasts the best commercial grade hot tub filtration which helps create the cleanest hot tub water and as a fully insulated hot tub, all Coast Spas are also proven to have the lowest running and heating costs. 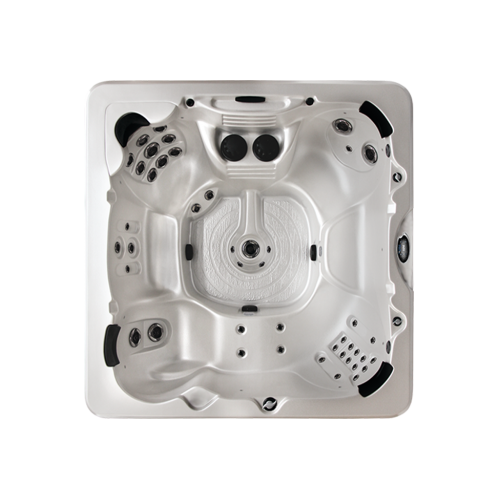 The Coast Spas 8L 46 hot tub with lounger has 5 impressive massage seats and a 2 way lounger seat which offers both relaxation and hot tub hydrotherapy. This luxurious hydrotherapy hot tub has been designed with an amazing variation of hot tub massage experiences from gentle muscle stimulation to deep tissue, shiatsu massage and is the perfect family hot tub for your garden if you can’t decide whether to have a lounger in the hot tub or all seats in the hot tub! The lounger is designed so you can stretch out in both directions or you can lay side by side in the hot tub with your partner. The rest of the hot tub seating is as comfortable and well thought out; designed so everyone can sit at the same level, enjoying the social benefits of hot tub, while also benefiting from the amazing hot tub massage experience. 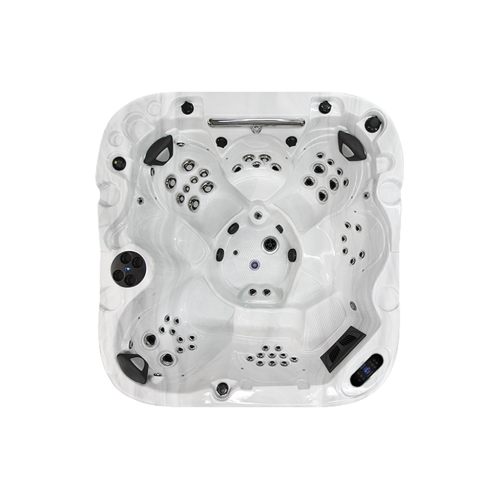 The B46 L out performs all jazuzzi hot tubs that have similar skimmer filtration, with the 8B having a more intense jet spa massage, cleaner hot tub water and overall being a much better value for money hot tub which is reliable. 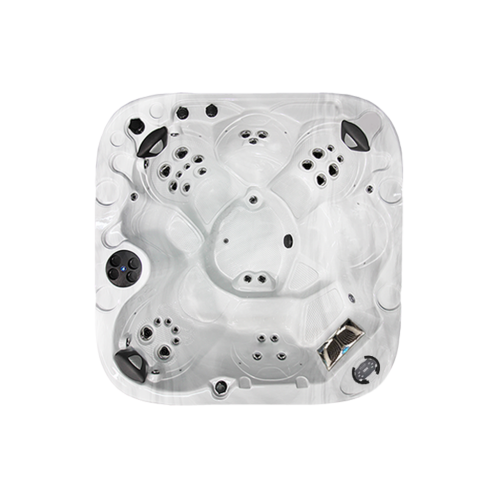 The 8L 46 hot tub made in Canada, is manufactured by Coast Spas. 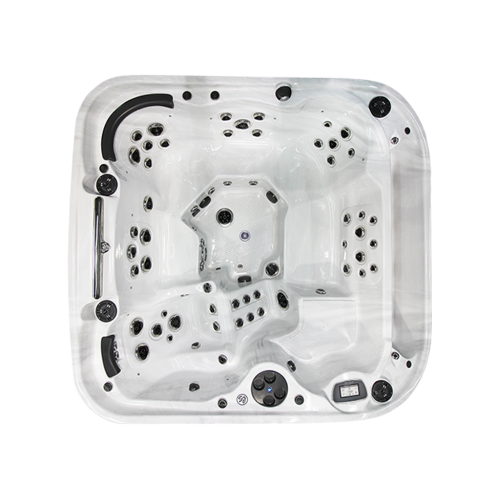 It’s not just a hot tub with waterfalls, powerful jets and easy maintenance, the 8L 46 boasts the lowest running and heating costs. credit subject to status and affordability. Terms & Conditions Apply. Award Leisure Limited trading as Award Leisure are a credit broker and are Authorised and Regulated by the Financial Conduct Authority. Copyright © 2018 Award Leisure, Inc. All rights reserved.